FOR IMMEDIATE RELEASEWashington, DCJUMBLEaya, a professional organizing and event planning company, has completely revamped its Website, JUMBLEaya.com, by making it an overall organizing experience giving visitors an opportunity to do much more than just visit. Director of Marketing for JUMBLEaya, Desirée Tucker, says the goal of the new site is for it to be its own online organizing tool by allowing visitors such privileges as obtaining advice on getting organized, chatting with experts and testing their organization skills. "We want visitors to get much more than information about our services. The purpose of the Website is to inform and help people solve real, everyday organizing dilemmas," said Tucker. Visitors to the Site can get answers to all their organizing dilemmas, from wedding planning woes to office organizing to the most efficient ways of packing the family up for vacations. Best of all its free. Advice is not the only freebie available on the Website. There are monthly sweepstakes and photo contests which visitors may enter and win gift certificates for stores, services and prizes. "No other company offers our combination of services, and because of the variety, we are essentially a one-stop-shop for all your organizing needs," said Tucker. "Each person needs organization in their life. Its our job to help get you where you want to be." Beginning November 21,2001, JUMBLEaya.com will be a brand new organizing experience, educating the masses about the importance of getting and staying organized. The site will also feature a bi-monthly newsletter, sponsorship options and opportunities for visitors to submit articles for the Website. "The site is designed to be extremely user friendly. Anyone can find what they are looking for if it's in our site," said Tucker. "They are no membership requirements--just bring your toughest organizing questions and problems and we'll do our best to help you find solutions." JUMBLEaya Professional Organizing (http://www.JUMBLEaya.com) specializes in organization and event planning. JUMBLEaya's goal is to provide you with a service that will reduce stress and keep you organized at the same time. The company formed in 1996, first offering organizational consulting to individuals and companies in the areas of home, office and personal time management. Since then, it has expanded and includes an Event Planning division and a Community Service division, while continuing to focus on teamwork and personalized consultation with clients. For more information on JUMBLEayas seminars, go to http://www.jumbleaya.com or e-mail info@jumbleaya.com. We hear many women, and even men, often complain about shoe storage problems. If you keep them in the boxes, you never remember what you have. If you keep them in stackable racks, shoes are constantly falling in between the rack poles or sliding off rack shelves. And let's not get into the behind the door racks. Nothing will bother you more than opening or closing a door and hearing shoes tumble to the floor. What's a shoe-loving woman to do? We found this neat little product that we happen to like a lot. It's a 48-Pair Womens Shoe Cubby from Stack & Stacks that measures 32-3/4"H x 33-1/2"W x 14"D. It can easily fit on the back wall of a closet or behind a door, it holds a lot of shoes, and solves the problem of not seeing what you have. 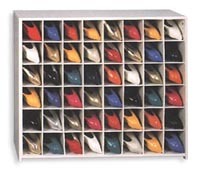 Stacks & Stacks have all kinds of shoe cubbies that hold 15 to 48 pairs of men and womens shoes. The Shoe Cubbies are available without doors (as shown) in white only. Cubbies with doors are come in white, black, oak, light cherry and dark cherry. Prices begin at $119.00 and go up to $249.00. You may order online or by phone Monday-Friday 7:30am-5pm (PST) at 1-(877)-278-2257. If you have a new and interesting product that promotes Getting Organized or Event Planning, please let us know about it. Fill out the feedback form or e-mail us at info@jumbleaya.com.